Before you get your shorts in a bunch, I don’t think the Coyotes are dead until they’re dead. That said, the math to make the NHL playoffs this year became more challenging after the loss to the Red Wings on Monday, the sixth loss in a row. We didn’t attend this game, after what turned out to be our final episode with drunken and boorish Red Wings fans that nearly resulted in fisticuffs, we decided to watch Wings games on TV. So, I had access to my DVR and my remote and took advantage of it. The Coyotes got off to a good start and were beating the Wings up and down the ice. Barbs looked sharp in net and the vibe was good. Then it happened. Again. The Red Wings scored first, only four minutes into the first period. Lately that fact, alone, probably had some Coyotes fans turning off the TV. Why? Because it has been the death knell for the game for whatever reason. The stats are convincing, we score first, we win the game. We don’t, we lose the game. The team was skating hard and playing well, though I’m going to jump ahead rather than analyzing the entire game. After all, losing 3-2 is the important analysis. This was set up as a “must win” game because it was a gut check for everybody. After a closed door team meeting and a lot of words being used to describe what was happening, it was obvious to all that this “return home” game was HUGE. Big enough that Tyson Nash pulled his nasty looking “must win” jacket out of the closet. At 6:12 in the third, Pavel Datsyuk scored the game winning goal. That’s what we’re here to analyze because even a casual fan such as myself spotted the errors. I did a screen grab of the crucial moment that explains it all, it didn’t have to happen. Click on the image to see what I mean, seriously do it. I’ll wait. Some nifty passing had Zetterberg steaming down the left side with Schlemko covering him. Schlemko did a good job with Zetterberg then peeled off to cover the front of the net when Zetterberg went below the goal line. OEL was on the right side and he moved down to cover Zetterberg who was obviously setting up to center the puck to somebody. That somebody was Pavel Datsyuk, a guy with some skills and he had Franzen backing him up. 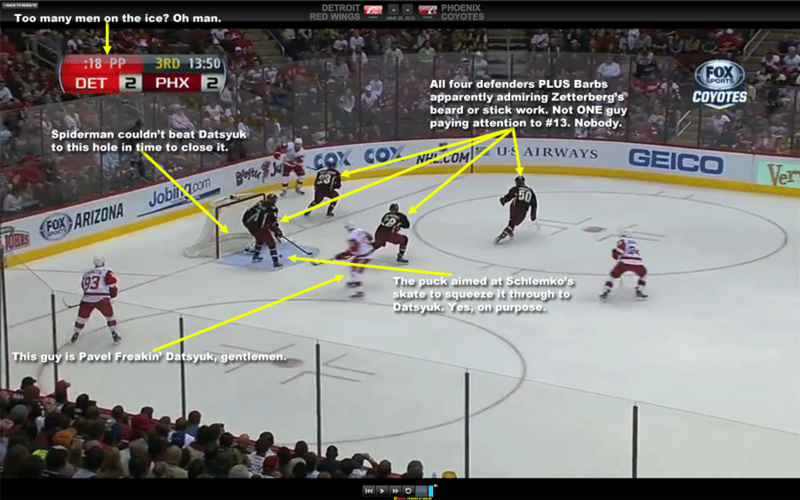 In the screenshot, all five Coyotes are staring at Zetterberg, leaving Datsyuk and Franzen unattended. Whoops. Zetterberg slides the puck to Datsyuk and the game is over. By the way, if Datsyuk didn’t get the goal for some reason, Franzen was close enough to the play to make it happen. Stanley Cup banners don’t hang themselves in the rafters without a lot of skill behind them. Dave Tippett, perhaps the best coach in the NHL, and I part ways in our assessments of the rest of the play. Let’s face it, the likelihood of ME being right and Coach being wrong about anything related to hockey is pretty slim, but I’m going to try to make my case anyway. 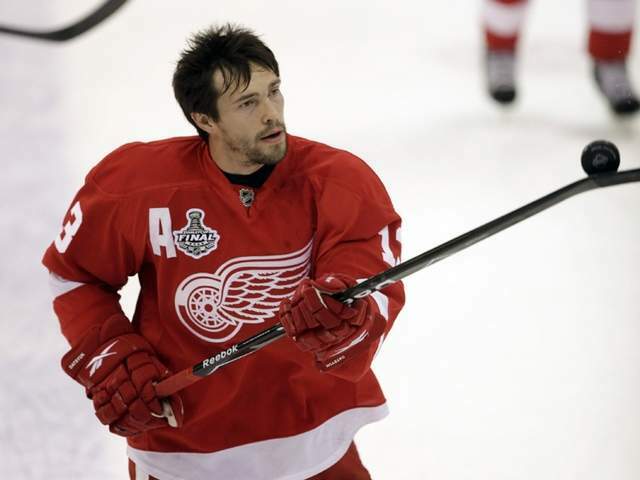 Tippett pointed to the game-winning goal, when Henrik Zetterberg’s pass across the crease from behind the net deflected off Coyotes defenseman David Schlemko’s skate and right to Datsyuk, as an example of the black cloud that is following his team. The power play was set up by a bench minor penalty that was also a bad-luck scenario. “The too many men on the ice (penalty) is a play that happens 100 times a game – one guy goes in one door, one guy goes out the other door, and the puck comes to the guy that steps on the ice (Boyd Gordon) as Hanzal is crawling off. A dumb penalty is inexcusable. Penalty discipline has been a problem in, I think, every game of the five lost in a row with this Wings game being the best. Handing a high offensive horsepower team like Detroit a power play chance is dangerous, Colonel Klinkhammer verified that in the post game interviews. The Coyotes handed them FIVE chances, racked up 10 minutes of penalties versus 6 minutes for the Wings. The Coyotes scored one power play goal, Detroit scored two including the game winning goal. That said, the Coyotes were doing a good job killing the penalty until they were apparently mesmerized by the puck. Tippett calls both the penalty and the deflection of the puck bad luck, I don’t think either one had anything to do with luck. Zetterberg and Datsyuk have been playing together for years. They work below the goal line all the time and both have ridiculous puck handling skills. I submit that Zetterberg’s pass went exactly where it was supposed to, off Schlemko’s skate and onto the stick of Datsyuk. Both guys have that skill level. There are some guys in the NHL that deserve “man” coverage regardless of the situation. Pavel Datsyuk is DEFINITELY one of those guys. He has crazy numbers and, truth be told, the numbers don’t even tell the whole story of the guy. So, Coach, I’d put young Ekman-Larsson or some other rapid, high skill defenseman (I won’t even say the name so people don’t get disturbed) on Datsyuk’s tail every single time he hit the ice. The schedule coming up for the Coyotes isn’t easy. They need to repeat their run of February last year and finish up like they did in the stretch run to the playoffs. It can be done, the team JUST did it last year. It’s getting down to must winsville for nearly every game now, check the math. Got to diagree with your breakdown on this one Geroge. The yotes were in good position and though they may be all looking the same direction at that split second I belive they were aware of 13 and Frazen. The pass should never have gotten past schlemco. If you watch the reply he has a brain freeze for a split second and loose focus on the puck and that alows it to get pass him. The yotes seem to be set up in the box in good position. I think the fact the pass gets through even with Schlemco brain freeze is an example of bad puck luck the yotes have been having. 9 times out of ten that puck does not make it through and more than likely gets cleared. Of the 1 out of ten times it get through it is usually not a tap in by the best puck handler in the game. Luck cannot be blamed for this horrible streak but the Yotes have not had any and I mean any good breaks go their way that could change a game in their favor. Hockey Gods are real and they are not pleased with the Yotes right now. Yeah, except OEL had a shot at the puck too and barely had his stick on the ice. If it was anyone else but Zetterberg and Datsyuk, maybe the Sedins I’d agree it was just a great play. Thanks for looking at it, Jo Jo! One more “must win” tonight.